Ion milling is the process of removing the top amorphous layer on a material to reveal the pristine sample surface for high-resolution imaging and post-processing. It is essential in many cases such as Transmission Electron Microscopy (TEM) and Electron Back Scattered Diffraction (EBSD) studies. During the ion milling process, a high-energy ion gun is used to bombard the top surface of the sample. The high energy ions interact with the loosely bounded surface atoms in the top amorphous layer of the sample under investigation and remove them to reveal an atomic level clean surface. Several parameters such as the ion energy, angle of beam incidence are adjusted throughout the process to optimize the sample preparation time and the quality of the surface. A depiction of an Ion Gun cleaning a sample surface by removing the top layer of atoms. In many applications of failure analysis, device quality assurance, and material characterization, a defect-free sample surface is required. Due to the advancement in materials and complexity of assembled parts, good quality sample surface is becoming more and more challenging with the need to come up with new and faster ways of sample preparation. In some applications such as electronics, semiconductors, biomaterials, when the cross-section of the material is of interest, ion milling can be used directly on the surface at a high angle of incidence to reveal the cross-section of the materials. These surface are not possible to prepare with traditional polishing methods. Transmission Electron Microscopy (TEM) samples require them to be very thing in the orders of 10’s of nanometers to be able to image them. It is virtually impossible to achieve it via mechanical polishing tools. High-energy ion gun is used for perforation of samples mounted on the TEM grids followed by gentle surface cleaning using a low-energy gun to get best data from XTEM, HRTEM studies. The high-energy Ga+ ion beams used in focused ion beam systems form defected, amorphous and/or implanted layer in the specimen. 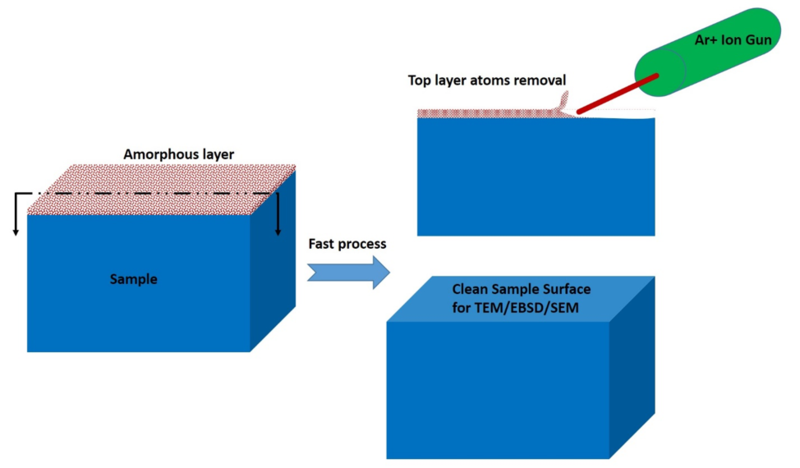 FIB, in general, produces TEM samples which are less suitable for high performance analytical (S)TEM (HRTEM, HRSTEM, high spatial resolution EELS and EDX) investigations. The low-energy Ar+ ion milling is ideal for the final stage of specimen preparation in order to decrease the defected layer. The usual mechanical grinding and polishing create an amorphous layer of 1 nm to 100 nm thickness on the surface, called the Beilby layer. The diamond polishing is also not recommended, because it can deform the grains on the surface. The ion milling overcomes all the difficulties mentioned above giving the surface finish needed for high-resolution EBSD maps. The commonly suggested colloidal silica polishing is generally applied for multiple hours leading to embedded residual polishing material in the surface grains. This technique produces better samples than mechanical polishing but is a very long process and still has issues such as only similar kind of samples can be prepared at a time leading to very poor workflow. The ion milling can be used for different kinds of samples and reduces the sample preparation time in orders of magnitude. Electro-polishing is another solution which comes with its complexity and nevertheless, in some cases, it cannot lead to the desired results. The major drawback is that it cannot prepare samples which are not electrochemically active. The process involves the use of hazardous chemicals that also adds to the regulatory requirements and needs trained professionals. The sample preparation is also longer compared to the ion milling. SEMPrep 2: High-quality site-specific sample preparation for SEM application. Unimill: Fully automated ion beam thinning system for TEM/XTEM sample preparation.